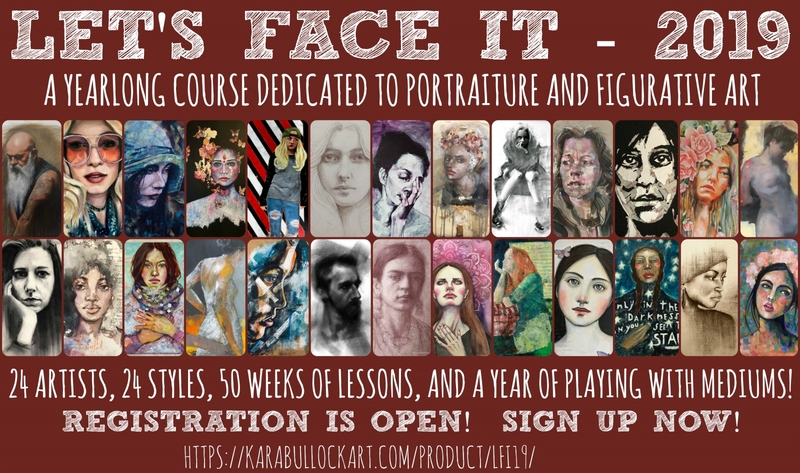 Let's Face It is a year long collaborative course all about faces, created and hosted by Kara Bullock. It is for anyone who wants to practice creating portraits and figurative art, but is especially designed for those of you that have felt scared or intimidated to do so at some point in your life. Together, we will share with you our strategies, tips and techniques that we use in order to create our portraits and figurative art. And, as a special service to you can get personalized feedback from me on your work. You will leave this course feeling confident enough in your skills to never feel intimidated again! My lesson for you will be creating a portrait starting out with loose charcoal, adding watercolors and then adding acrylics to create a truly mixed media portrait. I focus on looseness of strokes and expression. 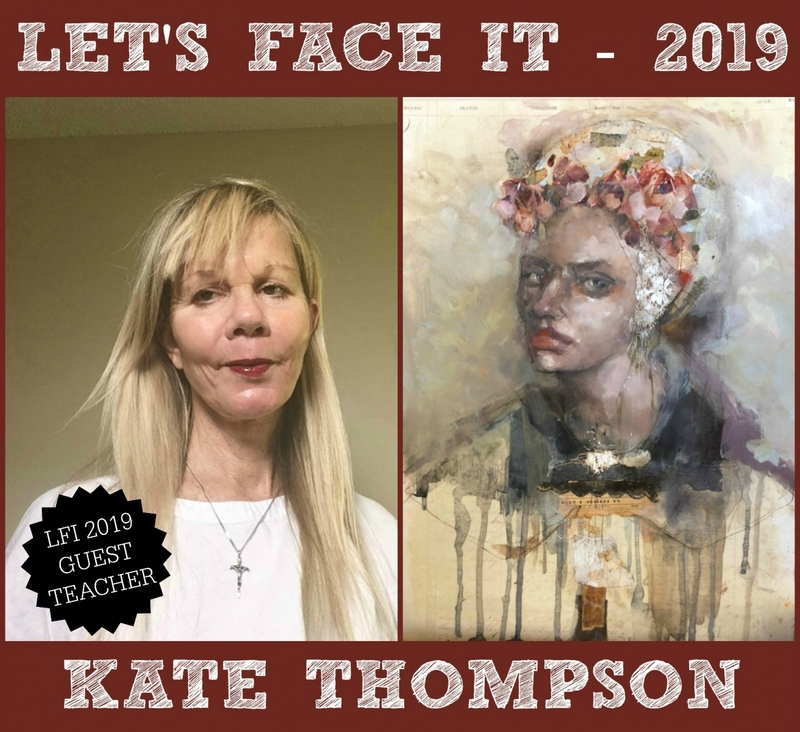 If you register before Dec. 3, you will get an early bird discount on the price"
I am thrilled that I can giveaway one free spot in Let's Face It 2019 to one lucky winner!! I will announce the winner on Oct. 5 here on my blog. The winner will be contacted by email, so please ensure your email address is valid. I would love to participate in a year long experience of rewarding art from amazing artists! I would love to win a spot in this class as I am relatively new to portraiture. To study with this incredible lineup would be an amazing opportunity! Thanks for the chance to win a spot! I want to improve my portrait and figurative rendering skills. Being able to study with you and the artists teaching in 2019 will be a sure way to fire up my practice and learn new practical techniques. I’m sharing on FB. Thanks for the chance to win! Will participate in lfi 2019 in order to have another class with you and with the other amazing teachers! Love, love, this course, it has been life changing in many ways. Thank you for this opportunity. I would love to win a spot in this course and learn from this variety of amazing teachers! Thanks for the opportunity! Shared on FB. I loved your online courses, in-person workshop, and I am THRILLED you will be on LFI 2019. Can't wait to learn with you again. I will also see you in person again in 2019! Thank you for the chance to win. I am excited to join LFI 2019 because I always learn so much from you and from each of the artists! I love to learn! I would love to win as by joining I would have a year of fun an creativity before me. I realy love to paint faces and i like to learn more. I would love to win to learn more about mediums I'm not as familiar with using. I've been expanding my supplies in the studio but not using all I have, not good. Hi Kate! Thank you so much for a chance to win. I have everything crossed that can possibly be crossed. I would love to win the spot because art keeps me going through tough times and art has really been a lifeline for me the last couple of years. Also, I know that art is a process where we're constantly learning and growing and as an artist I strive for both. I would love to win and start painting portraits with the wonderful community Kara has created along with the amazing teachers this coming year! Shared on Facebook. I would love to continue my portrait journey for free of course! I love your art and would love to learn from you. Thank you for this opportunity, I am very grateful. Shared on FB. I LOVE painting faces. It is my passion. I have so enjoyed LFI in the past and would love to win a spot in next year's addition. I have been enrolled in LFI from the beginning. I think it's the best value on the planet. I thought it would begin to repeat itself after the first year or two, but nothing could be further from the truth. Kara continues to up her game, adding new approaches and exciting new teachers every year. Where else can you spend $100 and get this much exposure to so many wonderful working artists. I do not complete all the lessons, but I certainly learn from each and every one. I will definitely be there, but would love a free spot - ill be 65 next year, so it would be a wonderful birthday gift! D love to win a spot in this class to Rutherford my skills. Oh my gosh - this would be so amazing - so much talent here!!! I have love, love, loved being part of 2018 and learning from all the amazing artists, their techniques, tips, and feedback. I sure would love the chance to keep learning in 2019! Thank you for this opportunity! I’d love to join LFI for the 4th year because I have learned so much over the last 3. I would love to join LFI 2019 to consolidate all that I have learned from the 2018 & 2017 courses. A whole lot of new teachers and some old favorites bringing their expertise to the table sounds wonderful. Thank you so much for the opportunity. I'd love to win a spot as faces are my favorite subject and I welcome the opportunity to learn new techniques from amazing artists! I shared on twitter and Pinterest! Posted on my face book. The reason I want to win is because money is tight and I love the line up of teachers - I'm sure I would learn a lot. Posted on my Facebook page.... Thanks so much for the opportunity to win a spot to continue on my artistic journey with this class that I have taken from the beginning!!! I've learned SO much in LFI2018, and I can't wait for next year's class! I'd love to win a spot. I'm looking forward to your lesson--your work is beautiful. I think the teachers in this class are amazing so either winning a spot or buying a spot is going to be one of the best classes that a person could have ! Thank you for this amazing opportunity!! I am really enjoying LFI 2018 and would like to keep exploring portraiture and figure work in the new course of study in 2019. I would love to be part of this journey, I love mixed media, watercolor, charcoal, , other mediums, and there are so many great teachers with wonderful ideas, I want to experience as much as I can! Shared on Facebook. Would love to win a spot for my fourth year of LFI and continue the adventure. Kate, congratulations your are teaching in Let's Face it. I did the first edition and developed in a very positive way. Edition 2019 MEDIUMS . I am a medium addict. Can 't seem to choose which one is my favorite. So really mixed media suits me. That's why I will participate in Let's Face it 2019. And having a chance to win a free spot?? Yes!! I have shared on Facebook. I am so excited about LFI2019. I have shared this post on Facebook, and I do so hope to win! Love your work, Kate! I would love to win a spot in this class. I am pretty good at drawing but would love to learn how to paint portraits. This class looks amazing. Thank you. It's a big opportunity to learn so many things from all these wonderful teachers! I’d like to give Let’s Face It a try! Shared on FB. I would love to join Let's Face It 2019 because I would love the opportunity to learn from all the different instructors. I would love to learn from all the great artists this year in LFI 2019...shared on FB! Shared on FB. I’d love to win a place this heat as the line up looks awesome! For the sheer joy of it! In learning and in doing. Thank you for the possibility to win a free spot! Let's face it is a wonderful course full of talented artist, I would like to improve my portrait skill and love your lessons very much. It would be a Xmas present to join. What a privilege it would be to have so many amazing teachers to learn from. It gives the student the opportunity to find their own artist voice by experiencing different art styles, techniques and approaches to creating a piece of art. I would love to be the recipient of such a wonderful prize. I would love to enter this coure ans learn techniques!